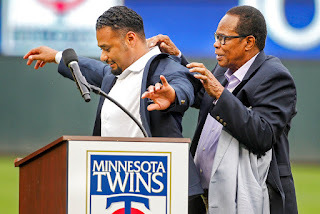 The Twins have twice in recent years, once under each front office regime, made concerted efforts to bolster the catching depth in the organization. Mitch Garver, who is as close as the 2018 Twins have to a primary catcher, is the product of the Terry Ryan regime's effort. Five years ago the Twins used three picks in the first nine rounds on catchers. Stuart Turner (3rd round) is out of the organization, and Brian Navaretto (6th round) is at Double A Chattanooga, where he is having his best offensive season to date, which isn't saying much. The Falvine regime made another push on backstops starting during last offseason and continuing though the draft. Two of those additions are on the Cedar Rapids roster right now, and I saw each behind the dish. Ryan Jeffers was the Twins' second-round selection in June. Like Garver and Turner, he's a college draftee (North Carolina -Wilmington); like Garver, he is viewed as a bat-first backstop. When Garver came through Cedar Rapids, he hit third for the Kernels. Jeffers hit third in both games I saw, first as a catcher and then as the designated hitter. His hitting lines in his two months or so as a pro are impressive, and he went 4-for-9 in the two games. The receiving skills are presumably a work in progress. Jeffers is big, and he doesn't appear to be as able as Joe Mauer was in his catching days to fold that big body into a low target. With no runners on, Jeffers frequently set up with one leg extended out to the side, a techinque I first saw used by Tony Pena some 30 years ago. I saw one pitch elude him on Monday, a delivery low and to the glove side that may have been a cross-up and definitely wasn't located where Jeffers was set up. I don't know how to apportion the blame for that one. David Banuelos had no such issues when he caught on Wednesday. But he also got no hits. Both fit the scouting report on him when the Twins got him from Seattle last November for international pool cap space during the Shohei Ohtani derby. He's been at Cedar Rapids all season, where both his on-base percentage and his slugging percentage are below .300. Chris Williams (8th round out of Clemson) has played strictly first base at Elizabethton, a level below Cedar Rapids, where he has hit 15 homers. That he hasn't caught yet as a pro may be significant. Trevor Casanova (13th round out of El Camino College in California) is also at E-Town and putting up pretty solid numbers at the plate. Jangison Villalobos, who was essentially a throw-in in the Phil Hughes salary dump during the season, is playing for the Twins complex team in the Gulf Coast League. He's old for that level, and I don't expect he'll ever get to Cedar Rapids. The Kernels program lists five outfielders, at least four of whom would logically be players the organization wants to see get substancial playing time. All five started at least once in the two games I saw on this trip, with probably the top two -- Trevor Larnach and Akil Baddoo -- starting both games, in right field and centerfield respectively. Trey Cabbage and Gabriel Maciel each started a game in left, and Jacob Pearson was the DH in one game. Larnach, the Twins' first-round draft pick (20th overall) this year, has split this initial pro season almost evenly between Cedar Rapids and Elizabethton. Neither level should be a great challenge for a college star from a big-time program. Larnach went 0-for-8 in the two games with a walk and a stolen base. He did have three hard-hit outs over the two games to left field. At 21, he is the oldest of the group of five, and the one with the least professional experience. Baddoo's stat line is intriguing. He's hitting about .240, which isn't impressive, but his on-base percentage is around .350 and his slugging percentage is over .400. He hit leadoff in both games, and like Larnach went hitless (0-for-8 with a walk and two steals). He's quite fast and made a nice catch at the wall Wednesday night. He's also just 19, quite young for the league. Pearson came to the Twins from the Angels last offseason when Anaheim was scraping up all the international pool money it could for the Shohei Ohtani derby. His skill set appears to be akin to Baddoo, but my sense -- and the stat line supports this -- is that the tools are pitched at a lower level than Baddoo's. He went 1-for-2 in his one start with a walk, an RBI and a run scored. Cabbage was taken in the fourth round of the 2015 draft as a third baseman. He's now splitting time between left field, right field and first base. He's gotten more playing time this season than in the previous three, and he's hit a little better, but probably not enough to merit being taken serious as a prospect. This is also the first season in which he hasn't been notably young for the level of competition. He went 1-for-4 in the game I saw him play with a double and a run scored. Like Baddoo, he's 19. Unlike the other four, who all hit left handed, he's a switch hitter. He made a nice running catch in left, and appears to be fast enough to play center. He hasn't hit for much power in the Midwest League (he played for Kane County before the trade), but that can come. This is, of course, low-A ball. None of them are on the cusp of the majors, although Larnach may be on a fast track. They have genuine tools. The challenge is learning to use them. The Twins had expected to have Michael Pineda ready to step into the starting rotation next month. They wanted to spend the rest of the season looking at Adalberto Mejia. Pineda, as you may remember, was signed to a two-year deal with an eye to 2019; he was to (and did) spend the season rehabbing his right elbow after Tommy John surgery. That went well enough that for the past month or so it was assumed that he would pitch in September. Instead, he has a meniscus tear. He might pitch winter ball. This, really, changes nothing about Pineda and 2019. He was expected to fill one of the rotation slots next year, and he's still expected to fill a rotation slot. The same cannot be said of Mejia's injury, described as nerve irritation. The lefty is out of options after this season, so he's either on the active roster in 2019 or waived. He's had a good season: 3.27 ERA in Triple A, 2.01 in five appearances in the majors. Hidden by the sparkling major league ERA: he's had just one appearance of more than 15 outs, his walk-to-strikeout ratio isn't good, and his strikeout rate is low. But that's just 22.1 innings. The walk and strikeout rates in Triple A were strong. The innings per outing, not so much. So Mejia really needed this opportunity. The Twins called him up in mid July to give him a chance to show, if not the Twins then somebody else, that he's capable of being a useful rotation piece. Instead, he's going to hit the offseason not only without that opportunity, but with a possibly significant health question. The Cedar Rapids Kernels -- the Twins affilate in the Midwest League and the organization's entry point to full-season professional ball -- are wrapping up the 2018 regular season. But they'll have at least a few more games after their schedule ends this weekend; on Monday night the Kernels clinched the second half divisional title, so they'll be in the playoffs again. The striking part about this to me is that they put up a better record after their top-shelf prospects -- Royce Lewis, Alex Kiriloff and Brusdar Graterol are all easily among the top five talents in the organization -- were moved up to Fort Myers and the Florida State League. That kind of player movement is pretty standard in low A. But that they got better after having to replace so many top talents speaks to the developing depth of the organization. Four of Monday's starters were 2018 draftees: second baseman Michael Helman (11th round, Texas A&M); catcher Ryan Jeffers (2nd round, North Carolina-Wilmington); right fielder Trevor Larnach (1st round, Oregon State); and shortstop Michael Davis (24th round, Texas Tech). The first three listed hit 2-3-4; Davis was the No. 8 hitter, but he homered and singled for three RBIs. His one out was also well hit. But the star for the Kernels was starting pitcher Randy Dobnak, who allowed one run on three hits in seven innings. Dobnak was signed as an undrafted free agent last summer after pitching college ball for a D-II school in West Virginia, and he leads the Kernels in wins and innings. The rest of his stat line isn't that impressive. He's allowed more hits than innings pitched, and his strikeout rate is the worst of the 22 pitchers who've taken the mound for the Kernels at least three times. He's old for the league as well. What Dobnak does do well is pound the strike zone. And that has worked well for him at this level. The odds are against him -- he's not going to get as many chances as Kohl Stewart has, because the organization hasn't much invested in him -- but he's nowhere near as excruiating to watch work as, say, Jake Odorizzi and Mike Pelfrey. And on Monday night, when the game ended, he got to spray some sparkling beverage on his teammates outside the dugout. Jake Cave, who wore "Caveman" as his uniform nickname during Players' Weekend. did something unusual Sunday: He walked three times. This increased his walk total by 33 percent on the no-longer-young season and gave him 12 on the year. Cave has gotten fairly consistent playing time against right-handed pitching for about two and a half months while Byron Buxton languishes on the disabled list/minor league rehab. Cave has shown genuine power at the plate -- slugging percentage .452 (all nunbers entering Sunday's play) -- and some significant flaws. The relative lack of walks is a signficant one. Cave's batting average (around .265) is acceptable; his on-base percentage (.303) is not. He has had a few TOOTBLANs -- Thrown Out On The Bases Like A Nincompoop -- which is hardly unique on this club. And his defense in centerfield was poor enough that in recent weeks he's played right field, with Max Kepler getting center field chores. One positive in the field: Cave picked up a pair of outfield assists Saturday and another on Sunday, giving him five on the season, four in his limited time playing right field. The flaws make him a reserve outfielder who is currently getting too much playing time. Other than being a left-handed hitter, it's not the typical profile for a fourth outfielder, who are generally expected to be better in center than Cave has been. But the Twins have regulars in the corners capable of playing center (Kepler and Eddie Rosario). Buxton on Sunday played in his third straight day for the Twins Triple-A affiliate, which suggests he's about ready to return. It's possible that they'll wait until the rosters expand to bring him back. When he does, Cave's playing time will probably pretty much vanish. He's not a better hitter than Rosario and Kepler, and this team really needs Buxton's defense and basrunning prowess. walk-off homer Friday night against Cleveland. Occasionally I hear people grumble about bad teams celebrating after a win. I'm not one of those. Yeah, Kansas City is having a rough season. It's not September yet and the Royals have lost 90 games. Baltimore's record is worse, but K.C. 's run differential suggests that it's the Royals, not the Orioles, who have the worst team in baseball. Hunter Dozier is hitting .217 with a .275 on-base percentage and .328 slugging percentage. This is ... bad. On Friday night, he and his teammates had a good game and they beat a quality team. They deserve to celebrate. Joe Mauer passed Rod Carew on the Twins' career hit list Friday. That's hardly an insignificant accomplishment, but it's also not something likely to make it onto a Cooperstown plaque. If we take the longer view and add in the Washington years of the franchise, No 1. becomes Sam Rice, a Hall of Fame outfielder who spent almost all of his 20-year career with the Senators, 1915-1934. Rice, who hit .322 for his career in the highest era for batting average, had 2,889 hits for Washington; he is, I believe, the player who came closest to the 3,000 hit club without reaching that round number. Rice, Puckett, and then two other old-time Senators, Joe Judge and Clyde Milan, neither of whom is in Cooperstown. Mauer is likely to catch Milan this year. Judge, he's going to need a couple more seasons -- and the same for Puckett, who is ahead of Judge by just 13 hits. Nobody other than Mauer, and maybe not even him, knows if Mauer's going to try to play next year. No matter how one slices and dices his stats, 2018 is shaping up as the worst of his distinguished career. He's 35 now, he has another child on the way, he missed about a month with concussion symptoms earlier in the season -- he has reason to hang 'em up if he so chooses. And he has reason to want to keep going. Even in his worst season, Mauer still has the team's highest on-base percentage (unless you count the likes of trade acquistions Logan Forsythe and Tyler Austin). Trevor Hildenberger pitched Thursday night. It wasn't a brilliant outing -- he served up another homer -- but he got the final three outs. It was an "easy" save, in the parlance of Baseball Info Systems, which tracks the difficulty of save opportunties. Sine the Fernando Rodney trade as announced Aug. 9, Hildenberger has appeared in five games. He has four saves and a win and was the final pitcher each time. The only save opportunity granted to anybody else came immediately after people started to suggest that Hildenberger was the new closer, as if to prove that no he isn't. Paul Molitor says it's a committee to close. He may even believe that. But if it's a committee, Hildenberger is clearly the chairman. Molitor handled his bullpen, which had to get 13 of the 27 outs, as he would have to get to his closer -- four outs from one guy, three from the next, divvy up the eighth between a lefty and a righty, and now it's the ninth and time for the star to enter. Defensive efficency is one of my favorite team-level stats: How often does this team turn batted balls in play into outs? The Twins -- no real surprise -- are not faring particularly well at that this season. Baseball Reference has the Twins DE at .678. They rank 26th among the 30 major league teams. Last season the Twins were 10th in the majors at .692. Flip them around, so to speak, and we find that their opponents (leaving out the homers and strikeouts) hit .308 last year, .322 this season. There are a lot of differences between the 2017 and 2018 models of this team, of course, and one of the most significant is Byron Buxton. Defensive efficiency seems to coorelate significantly to outfield defense, and the absence of Buxton shows in that regard. The "nothing falls but raindrops" motto of 2017 has not applied to 2018. The Twins traded this year for veteran starter Jack Odorizzi ($6.3 million this year, arbitation eligible next year, free agent after that) and signed, during spring training, veteran starter Lance Lynn ($12 million, traded last month the the Yankees). These moves didn't work as well as the Twins expected and hoped. It could have been worse. The Twins wanted to spend that money on Yu Darvish. He signed instead with the Chicago Cubs -- six years, $126 million. In year one of that contract, Darvish went 1-3, 4.95 in eight starts, and those numbers won't change. The Cubs announced Tuesday that he has a stress reaction in his elbow and is done for the season. Odorizzi and Lynn at least were able to take the ball and make their starts. Safe to say Stephen Gonsalves' debut didn't go so well. He got just six outs and had difficulty with his location. I hadn't seen him pitch before and was struck by the conclusion of his delivery, which seems almost nonchalant. He certainly doesn't look like a max-effort pitcher, which is a positive. Anyway. one poor start does not define him as a pitcher. I expect to see him again and again. His track record in the minors is good, certainly better than that of Kohl Stewart. So .. Ervin Santana and Aldaberto Mejia are on the DL, and I'm no longer expecting either to return this season. Aaron Slegers is also on the DL, and he apparently expects to return, although I'm not sure what his timeline might be. He's been out a while, and he's unikely to be ready to throw 100 pitches when he returns. Romero has already pitched more innings this season than in 2017, and I suspect the Twins would prefer to limit his total workload to 150-160 innings. Indeed, innings limitations might be the common thread as the Twins contemplate their September rotation. The Twins returned Ervin Santana to the disabled list during the weekend. The post-surgical middle finger clearly wasn't up to the demands of major league pitching. Presumably this is it for Santana as a Twin. He gave the Twins two solid seasons, one useless one, and one solid half-season marred by a steroid suspension. I'm not down on him for this useless one. He did what he could with the injury last year and did what he could with the digit in rehab this year. He said something a couple of starts ago about giving the team 100 percent of what he had, and I accept that. No, it's 2015 that still sticks in my craw. Who knows what that team would have accomplished had he not missed half the season with a self-inflicted banishment? The Twins were in the wild-card hunt right up to the end. Two pitching moves over the weekend: Stephen Gonsalves comes up to replace Santana in the rotation -- he starts tonight against the White Sox -- and the Twins sub in Alan Busenitz for Tyler Duffey. Gonsalves is an intriguing prospect. The fastball velocity is not overwhelming, the breaking ball is apparently mediocre, and the control record is not good. But he is absurdly difficult to hit. He has a good changeup, and the fastball is said to have a high spin rate, which apparently is an objective measurement that aligns with the old-school description of "sneaky fast." He was taken in the same draft as Kohl Stewart but three rounds later and was generally moved up the ladder more slowly. But he was better than Stewart on every level. I'm glad to see him up here now. I'm considerably more optimistic about Gonsalves's chances to be a useful major league starter than I am about Stewart. As for the bullpen move: The Monday print column examines the current state of experimentation in the Twins bullpen. The trades of Fernando Rodney, Ryan Pressly and Zach Duke opened three significant roles in the relief corps, and with the exception of lefty specialist -- Taylor Rogers assumes that role and Gabriel Moya slides into Rogers' old slot -- Paul Molitor is holding open auditions. It's a rather long column as these things go, and I didn't bother mentioning either Busenitz or Duffey. Thye're both clearly behind Trevor May, Trevor Hildenberger and Matt Magill, and probably, absurd as it sounds, behind Oliver Drake as well. Which doesn't mean either can't pitch their way into the Twins plans. It just means they're behind in the competition. in the first inning a Little League World Series game Thursday. I wonder if I'm the only one dubious of the wisdom of putting 12- and 13-year-olds' games on national television. Paul Molitor finally walked his talk about a bullpen committee Friday night. After giving the first three save opportunites since the trade of Fernando Rodney to Trevor Hildenberger, he turned a two-run lead over to Matt Magill. Thirty-some pitches later, Molitor turned a one-run lead over to Taylor Rogers, who got the final out and his first major league save. We'll see where Molitor goes from here. Tyler Austin's mammoth homer Friday night prompted a collegue to ask me about him, and I gave him the "Sano light" comp: Right-handed, big power, strikes out a lot, not as athletic as Miguel Sano. Nobody would play Austin at third base. And Molitor seems reluctant to try him at first base. Having decided to sit Joe Mauer, Molitor played Ehrie Adrianza at first base on Friday (with Sano at third). Austin, in his limited playing time this year, has an OPS (On-base Plus Slugging) more than 200 points higher against lefties than righties. That sounds like a platoon player, and it's really tough to carry a platoon DH on a 13-pitcher roster. A better comp for Austin than Sano might be Byung Ho Park, who showed prodigious power in his brief Twins tenure but failed to hit consistently. Part of Park's problem, however, was that he couldn't stay healthy enough to stay in the lineup. Joe Mauer didn't start Friday night, but he certainly played, pulling a three-run homer while pinch-hitting for Adrianaza. And then he flashed about as much emotion as we've seen from the even-keeled Mauer. When he stepped out for a curtain call, the thought flashed through my mind: He's going to retire. As with the stucture of the bullpen, we'll see. The expectation was that Ervin Santana would be moved this month in a waiver deal to a contender. Five starts into his belated 2018 season, that seems highly unlikely. Santana didn't get an out in the fifth inning Thursday. He is averaging a bit less than five innings a start with an ERA of 8.03. His velocity is down and his home runs are up. Clearly the surgery on his right middle finger has proven more serious than anyone involved expected -- or at least admitted -- back in February. The Twins hold a $14 million option on him for 2019. I expect them to pay the buyout instead and let Santana, 35. go. They may not even wait until the offseason. The time is coming when the roster spot, or at least the rotation berth, is more valuable than what remains to be paid of his 2018 salary. We're not there yet, if only because Aldaberto Mejia is still on the disabled list. The Twins can be patient and hope that Santana shows something useful in his next start. But if and when his presence gets in the way of evaluating Mejia and/or Kohl Stewart for 2019, Santana may well be release bait. It is a staple of managerial caution: The closer's job becomes vacant (trade, injury, ineffectiveness) and the skipper says he'll use a "committee" for the ninth inning -- and almost immediately slides one reliever into the ninth inning role. That's what Paul Molitor did last year when Brandon Kintzler was traded: proclaim a committee and slide Matt Belisle into the role. He did get some long saves from Tyler Duffey and Dillon Gee, but it was Belisle for three outs. The Twins have had three save opportunities since Fernando Rodney was traded. Trevor Hildenberger got each of them, including Tuesday and Wednesday. Molitor may not want to proclaim Hildenberger as closer, but what he does is more important than what he says. Hildenberger hasn't pitched in anything other than a ninth-inning save situation since the Rodney trade, and nobody else has pitched in a ninth-inning save situation. When the Nationals decided that Brandon Kintzler was a snitch and had to be eradicated from their "dysfunctional" clubhouse (see my overly-long Tuesday post) , they traded the right-hander to a better situation. He's now with the Chicago Cubs. Where, in his first six games, he has pitched four innings and walked five hitters. OK, one was intentional and four innings is a small sample size, but still ... that's not good. It's also not the Brandon Kintzler we saw with the Twins. I think he's going to be fine. The Cubs made room for Kintzler on their roster by demoting another former Twin, Randy Rosario. The young lefty has an ERA of 3.00, but he too has had trouble with the free pass, with 19 walks in 33 innings. One might want to rap the Cubs for demoting that ERA, but all those walks are a problem. He's also allowed five homes in those 33 innings, so the ERA is pretty much a mirage. The Cubs picked up Rosario on a waiver claim during the winter, the Twins having decided that they didn't have room on their 40-man roster for him. Similarly, the Twins lost J.T. Chagrois on waivers to the Dodgers early in spring training. Chagrois was been up and down with the Dodgers -- 37 K's in 30.1 innings and an ERA of 3.56. 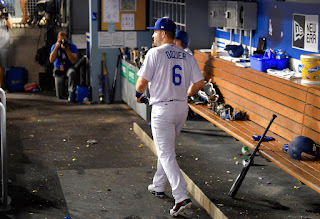 The Dodgers bullpen is a mess right now; closer Kenley Jansen is out after another bout of irregular heartbeat (this seems to come when he pitches in Colorado), and nothing is working out there for Dave Roberts. The Dodgers lost Tuesday's game on a ninth-inning homer. It was their fourth straight game in which the bullpen gave up the winning run in the final inning, fifth straight game in which the bullpen took the loss. Chagrois has been part of that problem. The assertion has persisted for generations: Managers don't greatly matter. The Washington Nationals right now are an intriguing case study for that assertion. The Nats have had a chronic revolving door for the dugout boss, apparently at the instigation of ownership, which has been willing to spend heavily on playing talent but not on managers. They have had newbie managers (including the current occupant of the job, Davey Martinez) and really old managers (including his immediate predecessor, Dusty Baker), but their one common denominator has been a lack of bargaining power. Matt Williams was their manager in 2014-15, his first and probably only stint as a major league manager. He won the divisional title in 2014, finished second in '15, and the defining moment of his tenure came when Jonathan Papelbon tried to choke Bryce Harper in the dugout and Williams had no clue about it. Out went Williams, in ccame Baker. The change wasn't as smooth as that; there was a tentative agreement with Bud Black that fell apart because Black had higher salary expecations than the Nats were willing to pay. Baker had been out of the game for three years and was willing to take the job at a bargain price. Baker now has 22 seasons on his managerial resume with a record well above .500 but only one pennant and no World Series titles. His in-game moves are often puzzling and his grasp of the metrics popular with today's front offices is not publicly apparent, but he has no peer at the delicate task of handling superstar egos. The Papelbon-Harper incident suggested that was a skill the new manager needed in Washington, and whether by intent or fortuity, the Nats got that skill. The Nats won a pair of division titles under Baker but didn't win a postseason series. Mike Rizzo, who heads the Nats' baseball operations, wanted to extend Baker after last season; ownership said no. Martinez, long an understudy to Joe Maddon in Tampa Bay and Chicago and almost as long a prominent candidate for managerial jobs, got the Nats post. There was every reason to expect him to be a good selection. But it has not gone well. The Nationals have, still, as much talent as any team. Harper, Max Scherzer, Anthony Rendon, Stephen Strasburg, Ryan Zimmerman, Daniel Murphy, Trea Turner, Gio Gonzalez ... Juan Soto, age 19, started the season in A ball and now has 14 homers in the majors. And they're running third in their division, barely above .500, and looking worse than that. What went wrong for the Nats this year? I suspect this is a case where "clubhouse chemistry" became a real thing. Just before the trading deadline, Jeff Passan of Yahoo tackled that question, and in the process of describing the Nats quoted an unnamed veteran as calling the clubhouse "dysfunctional." It was almost a throwaway line in the piece, but it got Rizzo's attention. Rizzo decided -- apparently incorrectly -- that the unnamed player was former Twins reliever Brandon Kintzler and promptly traded him away. A couple days after the deadline, another leading bullpen arm, Shawn Kelley, threw his glove on the ground after giving up a homer; Rizzo designated Kelley for assignment. With Kintzler and Kelley subtracted, and with Shawn Doolittle and Ryan Madson hurting, the bullpen has become a mess. And Kintzler and Kelley were subtracted in an attempt by the front office to support a beleaguered manager. One of the voices on MLB Radio, talking about the "dysfunctional clubhouse" description, saying that he'd been in the Nats clubhouse and had never seen a major league clubhouse so devoid of interaction. Whether it's "dysfunctional" or not, he said, it was unique. And I suspect Harper is at the center of it. Consider this: He is the star on a team of stars, a former MVP, a Sports Illustrated cover boy at 16 -- and yet you pick the stat, somebody in that clubhouse has had a higher number. Homers? Harper hit 42 his MVP season. Matt Reynolds hit 44 one year in Arizona. Batting average? Harper's high is .330. Murphy hit .347 the next year. RBIs? Harper's never had 100 ribbies. Murphy, Zimmerman and Rendon have all topped the century mark. But it's Harper at the top of the food chain, Harper whose future is the source of constant comment and speculation. You can't watch a game on TV without seeing Harper in an ad. Think that can cause some grumbling? Baker is, if nothing else, experienced at handling superstar egos -- and the interaction of the other egos. Baker had Barry Bonds and Jeff Kent in San Francisco, a pair of MVPs who apparently detested each other, They won. Baker had Sammy Sosa in Chicago. They won, although that situation got away from Baker. And with the Nats, there was scarcely a kerfuffle with Baker around. Before and after, drama aplenty. Yeah, the Nats miss Johnnie B. Baker. Not for pitching changes and when to hit-and-run, but for all the other stuff that comes with a major league season. Logan Morrison is now on the disabled list and done for the season, with hip surgery pending. The Twins could pick up his $8 million option for 2019. My instinct is that they will pay the $1 million buyout and let him hit free agency again. I will go so far as to say that there's no way both Morrison and Joe Mauer are back in 2019. They are both left-handed hitters, both over 30 and both limited to first base in the field. If both those assumptions are accurate, Mauer will be back for his age 36 season. And I think the roster makes more sense if there is a right-handed hitter complementing him for the 1B/DH roles. The Morrison signing made sense. It didn't work. I don't know how much the hip issue had to do with his struggles this year, but I think the Twins will move on. Baseball Reference's team pages display mug shots of that team's top 12 players by WAR. For the Twins at this typing, the top 12 includes two guys no longer with with the team (Eduardo Escobar and Brian Dozier), a DL-list pitcher with four starts (Adalberto Mejia), a shortstop still shy of 150 plate appearances (Jorge Polanco) and an outfielder likewise shy of 150 plate appearances (Jake Cave). Mauer is not among the top 12, even though he leads the team in the most important hitting stat, on-base percentage (150 PA minimum). It has been a disappointing season for the Minnesota icon, especially after such a solid 2017. He had the lengthy DL stint with concussion symptoms as well, so his return is far from a foregone conclusion. Both parties, the Twins and Mauer, could logically say no. I just think they're both inclined to yes. Kohl Stewart's debut Sunday matched the Keith Law scouting report referenced here last week. He throws strikes and lacks an out pitch. That might work if the defense is of genuine high quality, but that's not the 2018 Twins. In his fatal fifth inning, the balls in play turned into hits. His plus is a lot of ground balls. His minus is that the Twins aren't particularly adept at turning ground balls into outs. Paul Molitor gave him a shortstop at third base to try to help with that, but ... ultimately, it's real tough to be a starting pitcher in the second decade of the 21st century with a below-average strikeout rate. I see I forgot to do a Pic of the Week. Probably a sign that I should retire that Sunday feature of the blog. 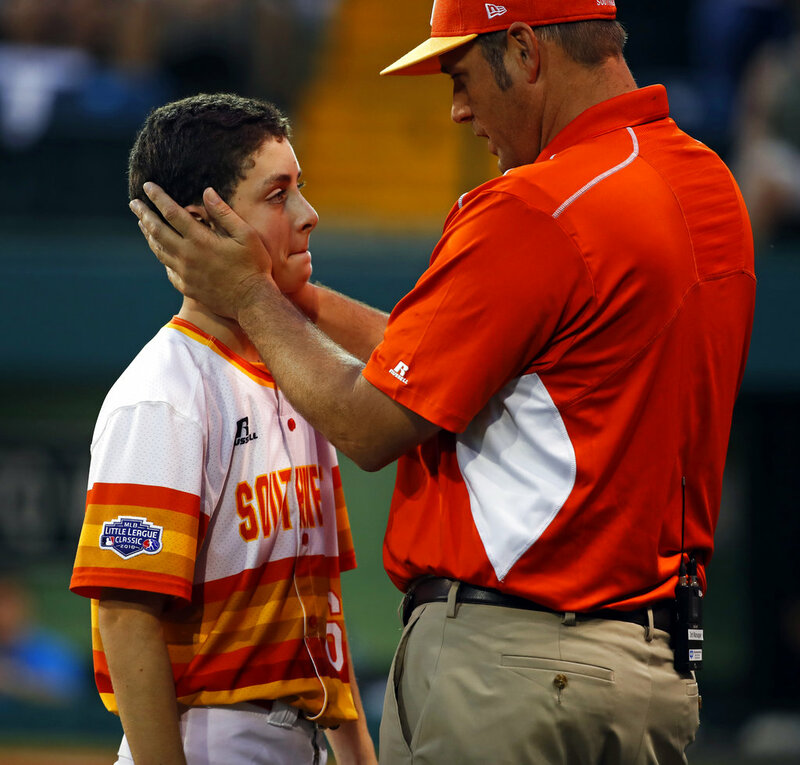 Baseball isn't the meritocracy we imagine it to be. Were Kohl Stewart the fourth pick of the 11th round of the 2013 draft, his performance in the minors might have gotten him released by now. But he was the fourth pick of the first round that year, and he's going to start for the Twins on Sunday. There are at least four pitchers in the Twins system I would rather see with this opportunity -- assuming their availability -- but it's Stewart who got the call. It may not be an extended stint in the rotation. The Twins reportedly don't believe the wrist strain that sent Aldaberto Mejia to the disabled list is serious; he may well miss just the one start. Dan: Kohl Stewart has put together some nice starts recently. Can he still become a viable starter? Keith Law: He hasn’t, though. Still throws strikes with no out pitch. We have seen Gibson transform from a guy who strikes out about 6.5 men per nine innings to, this year, 8.7. It's not impossible that Stewart has also learned how to use his stuff to miss bats. But I'm skeptical. The Twins moved Fernando Rodney to the Oakland A's in a waiver deal Thursday. As with the Brian Dozier trade earlier, I don't particularly care for it. The Twins could have kept Rodney; they had a reasonably priced option on him for 2019, and while The Fernando Rodney Experience can be difficult to watch, they have no obvious successor to him for the closer role. And the significant thing about not having an obvious closer candidate is that it makes organizing the rest of the bullpen more complicated. This is Paul Molitor's fourth season as manager. It is the fourth season in which he has had to change his closer in midseason. has never held the closers role before. The closest thing to that template on the current roster might be Matt Magill, who is 28, has zero career saves and has walked just two men per nine innings since his callup. Another possibility would be Trevor May, who has had a fraction of Magill's innings as he forges his way back from Tommy John surgery. He's also 28. Of course, Molitor could discard that template and try one of the younger arms. Gabriel Moya has a pretty impressive minor league record as a closer. So does Trevor Hildenberger, who is slumping. Molitor seems to have regained faith in Taylor Rogers, and there are power arms in the minors (Alan Busenitz, John Curtiss) who could tolerate a sustained opportunity. Another possibility, one that would really shatter the Molitor mold: Fernando Romero. I really have no clue what Molitor will do. And just to further complicate this, there are rumblings that the Twins may soon adopt the "opener" strategy deployed this season by Tampa Bay. Dakota Chambers, the arm the Twins got in the trade, is a really high-risk acquisition. He pitched all of five innings this season (low-A Beloit) before having Tommy John surgery. He had no history of success before the surgery, largely because he has never thrown strikes with any consistency. When I say I don't care for this trade, it's because it is exceedingly unlikely that Chambers will ever reach Double A, much less the majors. As for Rodney and the A's: Oakland appears to be following the Kansas City Royals model of 2014-15 and stacking up power arm relievers. Blake Treinen is at the top of that food chain (0.93 ERA with 29 saves and one homer allowed in 58 innings), with Lou Trivino (1.29 ERA) behind him, joined now by Rodney, former Mets closer Jeurys Familia (2.31 ERA, 17 saves before his trade to Oakland) and Shawn Kelley, formerly of the Nationals (3.27 ERA this season). Rodney's not likely to get to fire a lot of metaphoric arrows the rest of the way, but he's now part of a bullpen of extraordinary depth and quality. Forty-some years ago whoever The Sporting News had as its correspondent for the then-California Angels referred constantly to that team's bullpen as "the Arson Squad." It's rare today to see a relief ace called a "fireman," but you get the idea. Trevor Hildenberger today is more an arsonist than a fireman. Wednesday marked three straight appearances for him with a home run allowed. I won't pretend to know what the problem is; I know there's a problem. Underlying the Hildenberger-specific problem that's leading to all the long balls is one of roster construction. The Twins have too many bullpen guys Paul Molitor doesn't want to use in game situations -- like the ninth inning of a tied game, which was the situation Wednesday when Hildenberger served up his most recent tater. Fernando Rodney and Taylor Rogers, yes. Beyond that, with the trades of Zach Duke and Ryan Pressly ... the abyss. Hildenberger is the favored arm of the rest of the pen partly because he has had some success, partly because he's (presumably) sound and partly because he's right handed. Gabriel Moya is getting some work as a second lefty; essentially Rogers has moved into Duke's role as the favored lefty and Moya has moved into Rogers' old role. Fine. Trevor May -- who did pitch Wednesday -- is in a rehab season after his Tommy John surgery. I assume Molitor wants to avoid using May on consecutive days. Addison Reed is supposed to be a bullpen factor, but he has pitched just twice since coming off the disabled list, on July 31 and Aug 4. If he needs that much rest between outings, he probably shouldn't be active. Matt Magill -- another guy who did pitch Wednesday -- has been pigeonholed as a long man for much of the season. Molitor has been reluctant to use him late in games, and nine of his first 25 appearances came with leads or deficits of more than four runs. And Oliver Drake -- I haven't the slightest notion what he and his 7.31 ERA (compiled on a major league record five teams, including the Twins) is doing on this roster. I do know what he isn't doing, and that's pitching. At least the overmatched Matt Belisle is off the active roster -- not DFA'd, but on the disabled list. This means we will probably get another dose of him next month at the latest. Oh joy. Trevor Hildenberger pitched the eighth inning on June 28. He faced three hitters, retired them all, turned a one-run lead over to closer Fernando Rodney and the Twins won. His ERA at the end of that game was 2.06. Trevor Hildenberger pitched the eighth inning Tuesday night. Other than that he turned a one-run lead over to closer Fernando Rodney and the Twins won, it had little in common with the June 28 hold. Hildenberger allowed three hits (including a homer) and two runs. And his ERA after the outing was 4.07. That's a pretty sharp increase in little more than a month of relief work. The biggest issue for Hildenberger this year has been home runs. The long ball he surrendered Tuesday night (to Francisco Lindor) was his eighth in 55.1 innings. That's 1.3 homers per nine innings, and that's way too high for a late-inning guy. But his walk rate is up a bit from 2017 and his strikeout rate down slightly as well. Those numbers aren't terrible this year -- not like the home run rate -- but those declines aren't helping. But I literally don't see anybody on this roster who is likely to get an opportunity to supplant Hildenberger as the primary right-handed bridge to Rodney. Addison Reed, who had that job at season's start, has been even more homer-prone than Hildenberger and has been given plenty of rest between outings since his return from the disabled list. Hildenberger is going to get an opportunity to work his way out of this slump. Nothing in bullpens is ever set in stone, but it appears Taylor Rogers has somehow found himself back in the eighth-inning role he held for a goodly chunk of 2017. Everything in his stat line says he's best suited for a lefty specialist role. But Paul Molitor isn't particularly inclined to use any pitcher in the manner that Ron Gardenhire used Dennys Reyes about a decade ago. Reyes thrived as a true LOOGY, and Rogers might also, but it's not easy to limit one bullpen arm that strictly if the starters are only getting about 15 outs. Rogers had 30 holds in 2017 -- holds being an unofficial stat that count the save opportunity leads handed off to the next reliever. He has seven so far this year. This tells us more about how Rogers has been used than about the quality of his pitching. Molitor trusted Rogers with late leads much more frequently in 2017 than in 2018. Part of that was the offseason additions of veterans Zach Duke and Addison Reed, who were initally Molitor's preferred setup men this year. But now Duke is gone (as is Ryan Pressly) and Reed's role after his first-ever stint on the disabled list is uncertain. Rogers and Tyler Hildenberger appear to be the primary options for the seventh and eighth innings. Hildenberger's role has been relatively stable. Rogers' has not. For a while, he was frequently the first man out of the bullpen. His ERA at the end of April was 8.44, and whle ERA is an imperfect yardstick for relievers, it's difficult to brush off one in the mid-eights. But Rogers has only been charged with runs in seven of his last 36 appearance. His 2018 ERA is down to 4.03 -- still almost a run higher than his 2017 mark, but less than half what it was entering May. The Twins bullpen isn't as deep as they need it to be. In a truly deep bullpen, Rogers wouldn't be the primary eighth-inning guy. But he would have a role. Sunday was another Fernando Rodney Experience save. He allowed three base runners but escaped unscathed. I did not greet last winter's signing of Rodney with enthusiasm. I coped in part by surmising that this ancient wonder of the bullpen world was going to serve as a place holder for a younger closer who was yet to emerge from a field of candidates. It's August, and that younger closer has yet to show himself. The Twins have used 19 relief pitchers (not counting moonlighting starters or position players), and Rodney has the lowest ERA of the lot. I have resigned myself to the liklihood that the Twins will pick up Rodney's option ($4.25 million for 2019 or a $250,000 buyout). He'll be back for another round as closer next season. I don't think that's ideal, but none of the young power arms has forced his way into the Twins thinking. Of course, none have been given a genuine opportunity to hang around for more than a couple days at a time. with assistance from Rod Carew. Johan Santana declared during his pregame speech that he is indeed retired as a pitcher now. So he has accepted the reality. It's been six years since he last threw a competitive pitch. For a few years teams would extend minor league offers in hopes that he could find his way back, but those offers eventually dried up. For a few years, he was as good as it gets. Santana nights at the Dome were magical, and I seldom passed up the opportunity to watch him work. Pitching in the majors takes its toll. Santana' star burned brightly, and then it burned out. But I will long remember his mastery of the changeup, the heat of his fastball, the sense that anything was possible when he took the mound. He drags an 8.59 ERA to Minnesota, which I guess is why so many teams have decided they can do without him. I expect the Twins will decide the same this winter if not sooner. Who will go to make room for him is unknown. My choice would be Matt Belisle, but it's pretty clear the Twins brain trust thinks more highly of him than I do. Johnny Field is an infielder who got 179 plate appearances with Tampa Bay before being DFA'd. The Twins are assigning him to Rochester. Their additions refill the 40-man roster. As far as i can tell, they could just as well have left the slots open. Every other Thursday I do a half-hour segment on KMSU, a public radio station affiliated with Minnesota State University, Mankato, talking Twins with station director Jim Gullickson and, most weeks, Mark Halverson, a local attorney, KMSU host and Twins ticket holder. I was, I fear, more incoherent than usual during Thursday's segment, and never more so than when Gully asked if we were going to see a bunch of "fresh faces" the rest of the season. So I'll try again, this time with the ability to rewrite a sentence before exposing it to the public. It depends on what is a "fresh" face. The Twins -- and pretty much every other team -- have a lot of roster churn, particularly among the pitchers. Is Gabriel Moya -- who had two brief stints in the Twins bullpen earlier and was recalled to take Zach Duke's spot in the bullpen -- a fresh face? Is veteran infielder Logan Forsythe, who has as of this morning one at-bat in a Twins uniform, a fresh face? Forsythe is merely a placeholder. I'll probably write something about the Twins' second base options soon -- it may even be the Monday print column next week -- but I'm not giving anything away here by dismissing Forsythe as a contender for the job in 2019. May is rehabbing from Tommy John; these next two months give the Twins a chance to evaluate his future role if any. Mejia is out of options next season; he is auditioning for a role in the back of the 2019 rotation. Moya -- the hope is that he can be a younger version of Duke, a reliable LOOGY out of the bullpen. And of course, Sano. He's supposed to be a franchise cornerstone. He has been anything but in 2018. The Twins desperately need to get him right. Sano is not a fresh face, but the Twins hope these final two months are a fresh start. Brian Dozier homered, doubled and singled Wednesday in his Dodger debut. Three-for-4 with seven total bases is a pretty good way to boot up. Zach Duke didn't allow a homer in 37.1 innings with the Twins. He made his first appearance with Seattle on Tuesday and gave up a homer to Josh Reddick. A LOOGY throwing a gopher ball to a left-handed hitter ... ouch. Lance Lynn was almost unrecognizable in his Yankees debut; the Yankees don't allow beards, and Lynn has had one throughout his major league career. New look, good results: 4.1 scoreless innings of relief on Thursday against Baltimore. Sonny Gray had already put the Yankees well behind, and Lynn did allow an inherited runner to score, but the overall impression was strong enough that there is speculation in Yankeeland that Lynn will move into the starting rotation. Ryan Pressly, like Duke, gave up a homer in his first outing with his new team -- in this case, Houston. I had the glimmer of a notion that the Astros might try him as closer, but the controversial trade for Roberto Osuna, who faces domestic violence charges in Toronto, probably closes that door. Eduardo Escobar is doing Eduardo Escobar stuff for the Diamondbacks. He doubled (of course) in his debut against the Padres and had two hits in each of his first two games with Arizona. It sounds, by the way, like Jake Lamb, nominally Arizona's regular third baseman, might be done for the season with the injury that helped prompt the Snakes to deal for Escobar. So Brian Dozier is gone, traded to the Los Angeles Dodgers in the final hour before the trading deadline. Of the five deadline deals swung by the Twins -- trades that stripped veterans Dozier, Zack Duke, Eduardo Escobar, Lance Lynn and Ryan Pressly from the roster -- the best "get" came from the Pressly trade, and that's because Pressly was the only one who isn't a two-month rental. I'm not impressed by what the Twins got for Dozier, and that's not surprising. Remember: The Twins actively peddled Dozier two offseasons ago without pulling the trigger. If the published reports are accurate, the Dodgers made the best offer, and that was pitching prospect Jose De Leon. Had the Twins done that deal, I would have ripped it. The Dodgers were apparently intent that winter on trading De Leon for the best available second baseman; they settled on Logan Forsythe, then of Tampa Bay. Forsythe didn't hit as well in Los Angeles as he did with the Rays -- no surprise considering the difference between Tropiciana Field and Dodget Stadium as home environments -- and De Leon has pitched a total of 41 innings, majors and minors, since the trade. And now Forsythe is a Twin. Presumably he'll play second base the rest of the way in Minnesota and then be allowed to join Dozier in the free agent market. I would not have done this trade were I making the call. Even if, as I expect, Falvine have no interest in an extension with Dozier -- who is 31 and putting up his worst numbers since his rookie season -- I don't think the return justifies ripping out such a key foundation piece in midseason. If this was the best they could get for Dozier, walk away. The Twins blew past their allotted payroll with the spring training signings of Lynn and Logan Morrison; it's possible that Falvine were told that if they're going to sell a priority would be getting payroll under budget. The Dodgers today acquired second baseman Brian Dozier from the Minnesota Twins in exchange for infielder Logan Forsythe and minor leaguers Luke Raley and Devin Smeltzer. Forsythe I touched on already. A few months older than Dozier, a higher draft pick, less accomplished. He's a placeholder, included in the deal to keep the Dodgers under the luxury tax and because somebody has to play in the infield in Minnesota and Nick Gordon is flailing at Triple A. Three years from now we'll have pretty much forgotten he ever played with the Twins. Raley is a left-handed hitting 1B/OF, 23, putting up what appear to be decent numbers in Double A but in what I perceive to be a very good hitting environment. Smeltzer is a left-handed pitcher, 22, putting up what appear to be atrocious numbers in Double A but in what I perceive to be a very good hitting environment. Neither is a particularly well-regarded prospect. One other point before I get on with my life today: There will be chatter about the Twins mishandling the Dozier "asset." That's nonsense. I don't know why the rest of MLB didn't properly value Dozier two winters ago, but the Twins got lowballed in trade talks. They kept Dozier; he hit 34 homers, won a Gold Glove and the Twins won a wild-card berth. It was the correct decision. They were going for it this year and thus didn't attempt to trade him last winter; nobody was surprised by that decision. Even if I don't care for this return, they got more from the Dodgers for two months of Dozier than they were offered by the Dodgers for two years of him in the 2016-2017 offseason.